Jim McGee has a good list of books on knowledge work at his blog. I recognize a number of favorites (Information architecture; anything by Christopher Alexander, though the choice here is one of the denser ones; and Don Norman’s Design of everyday things.) Others are not my favorites – Gause and Weinberger’s "Are your lights on?" is one of the few books I have actually thrown out. Langer’s Mindfulness I read in grad school and it irritated me with what I felt were rather simplistic exhortions to pay attention. Much as I like many of these books (at least for the ones that focus on the thinking part of knoweldge work), I wonder whether we have a causality problem – is it that people who work smart and pay attention seek out books like these, or do reading them actually help in some way. I suspect that there is some sort of middle ground – people who are aware of the need to think creatively create crutches for themselves, partially by exposing themselves to many patterns, and then get a jump start in the writing, searching (an area missing from Jim’s list, incidentally) or creative process by starting from a known example or platform. In one of his books, Richard Feynmann explain a colleague’s incredible performance in standup mathematics by saying that he had worked so much with numbers that when faced with any calculation he could approximate fast – "It was easy for him – everything was close to something he knew." Some of these books – and I suppose which book will work for whom is highly individual – will offer a few more known places to start from. This entry was posted in Reading on February 28, 2006 by Espen. Harvard Magazine has a good introductory article on behavioral economics (with sidebars). I liked the idea that the field should have been called cognitive economics – makes sense, with fewer pigeon connotations. This entry was posted in Academically speaking on February 28, 2006 by Espen. Just back from Vilnius in Lithuania, where I taught a two-day module in strategic management at the International School of Management. The school kindly invited us to see the ballet The Russian Hamlet at the Lithuanian National Opera. 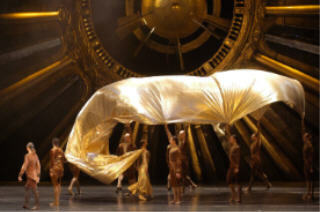 The performance was excellent and heartily recommended – an impressive feat of choreography, scenography and dancing. Vilnius turned out to be a pleasant city of excellent restaurants, small streets, old churches and, rather surprisingly, a huge shopping center called Akropolis, with an indoor skating rink (the only other place I have seen that is in Dallas). Not a bad place to spend a weekend, escaping an Oslo digging out from another large snowfall. This entry was posted in Itinerancy observations on February 21, 2006 by Espen. Marc Hedlund has a great little reflection on various new ways of Web Development 2.0″ href=”http://radar.oreilly.com/archives/2006/02/web_development_20.html”>digging into the nuts and bolts of Web 2.0 services over at O’Reilly Radar. I am currently mulling over search as a disruptive technology in preparation for a talk in March, with FAST CTO Bjørn Olstad. Seems to me we are increasingly moving to a situation where we all are on one (or, at most, a few) system(s), and that fact rather than what we can do as individuals is beginning to catch up to us. This entry was posted in Digital reflections on February 15, 2006 by Espen. I am, I think justifiably, rather proud of my eldest’ writing skills and ability to lay out an argument. At that age, I was crawling around in uniform and reading spy stories. This entry was posted in Up close and personal on February 14, 2006 by Espen.